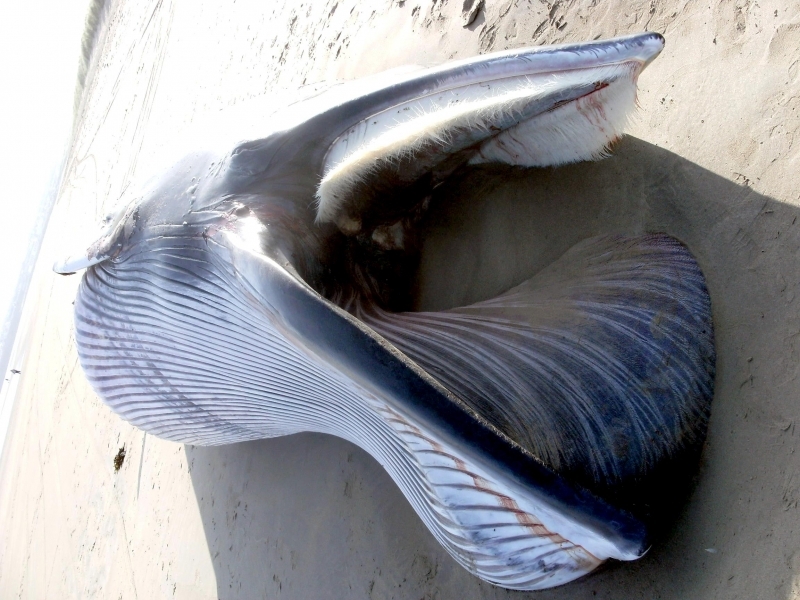 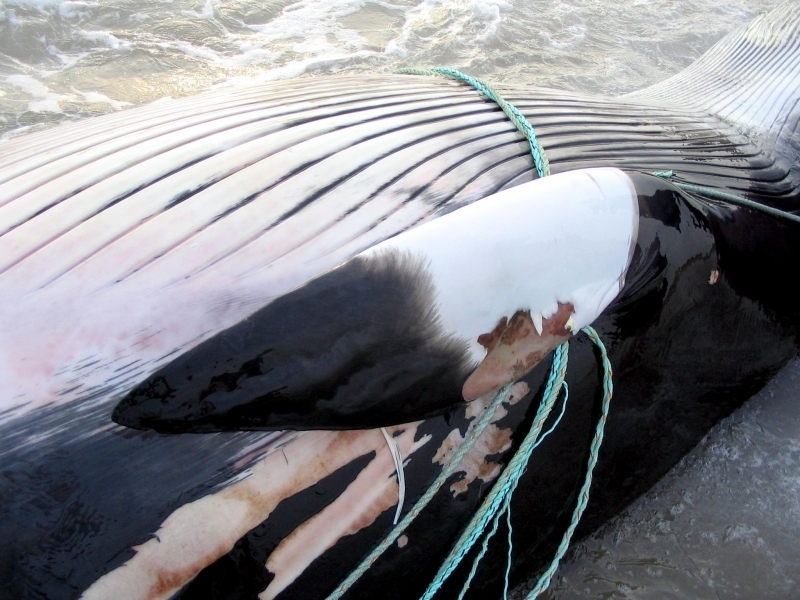 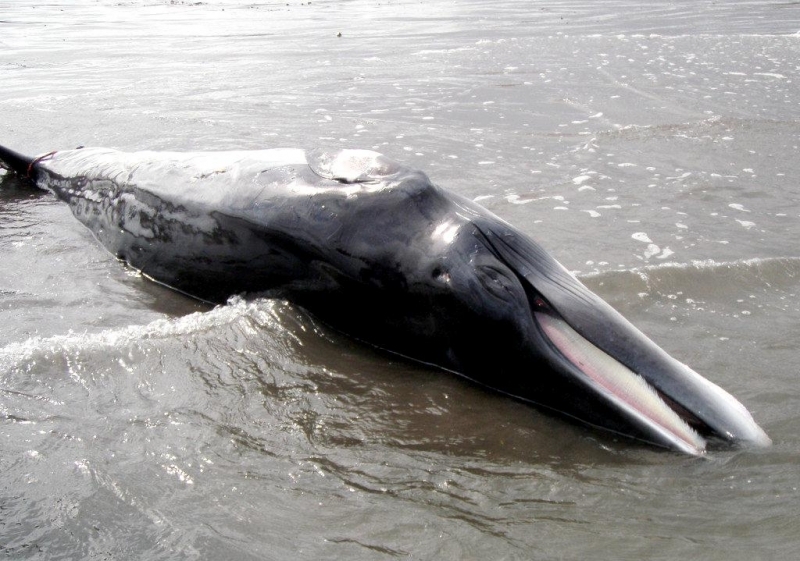 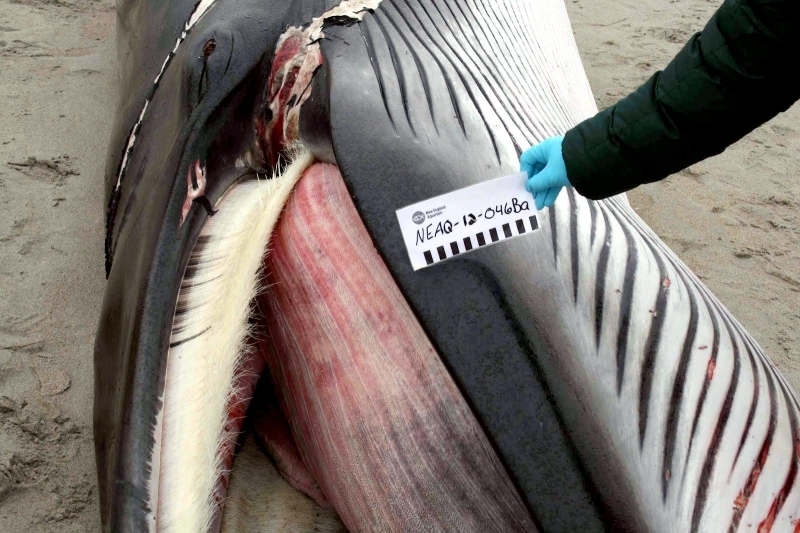 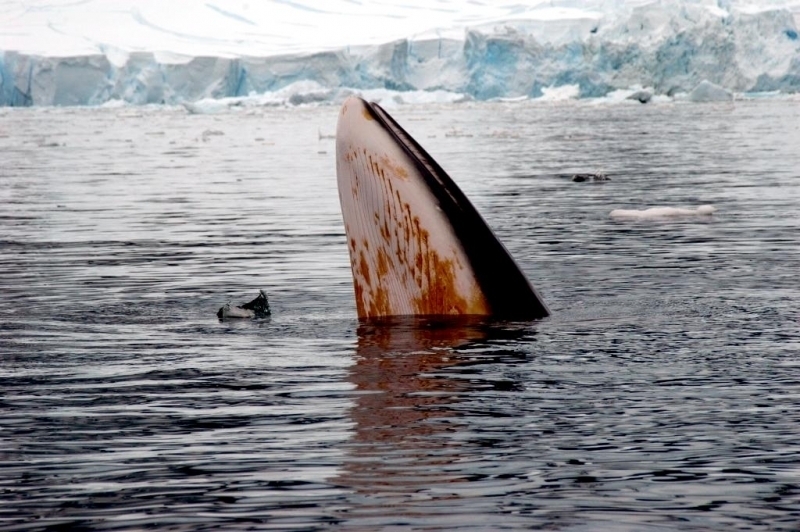 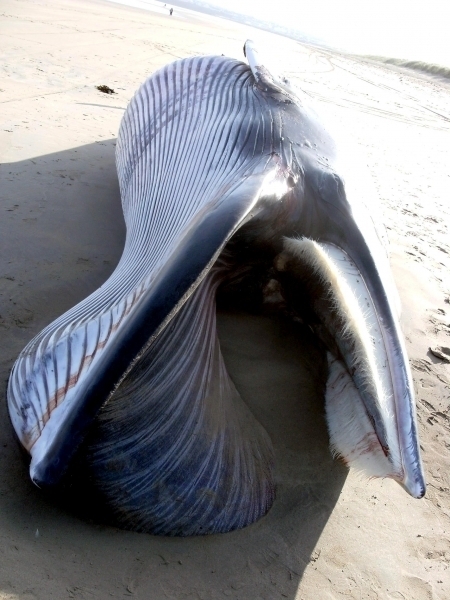 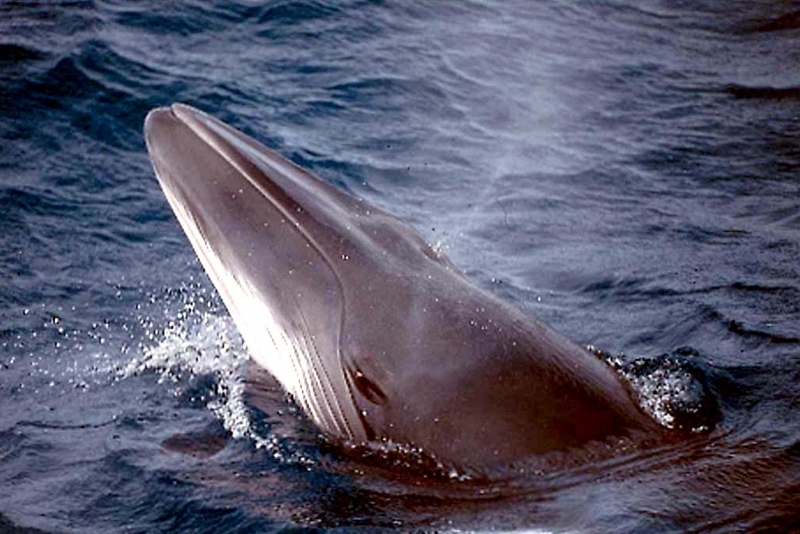 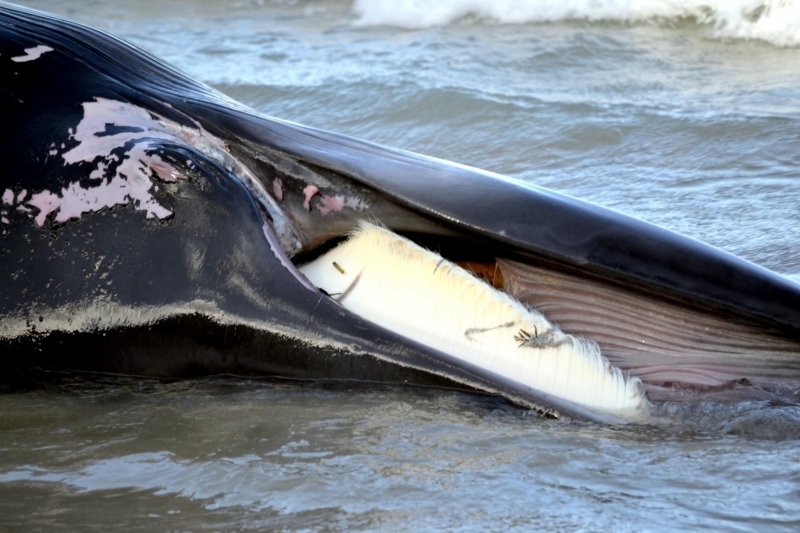 Minke Whales are the smallest of the baleen whales with 50-70 throat grooves. 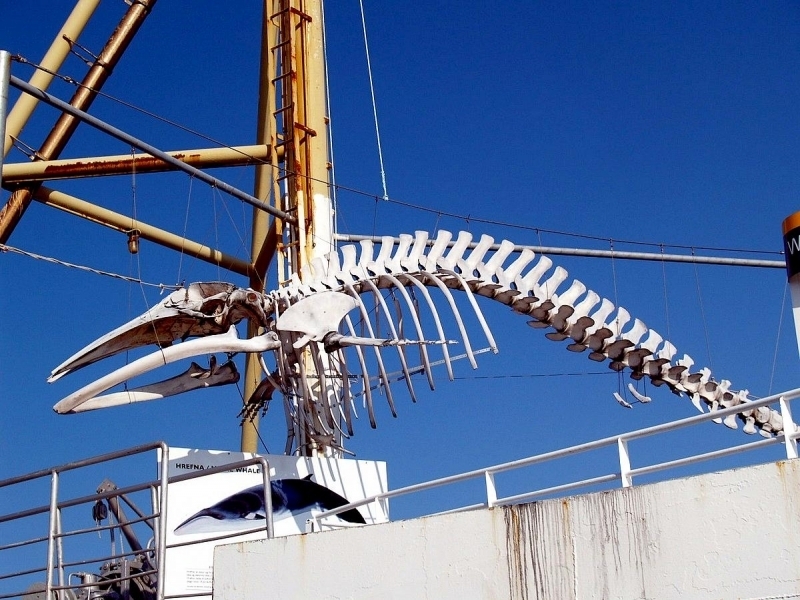 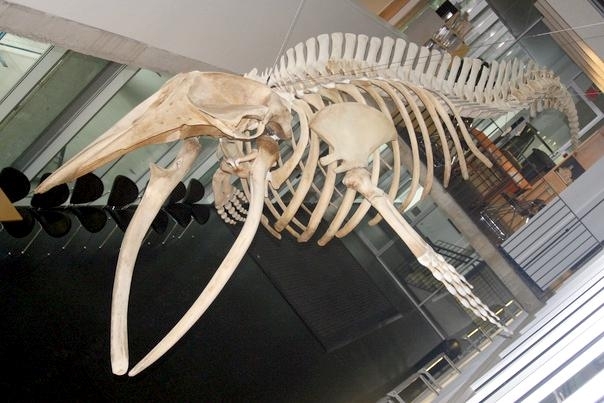 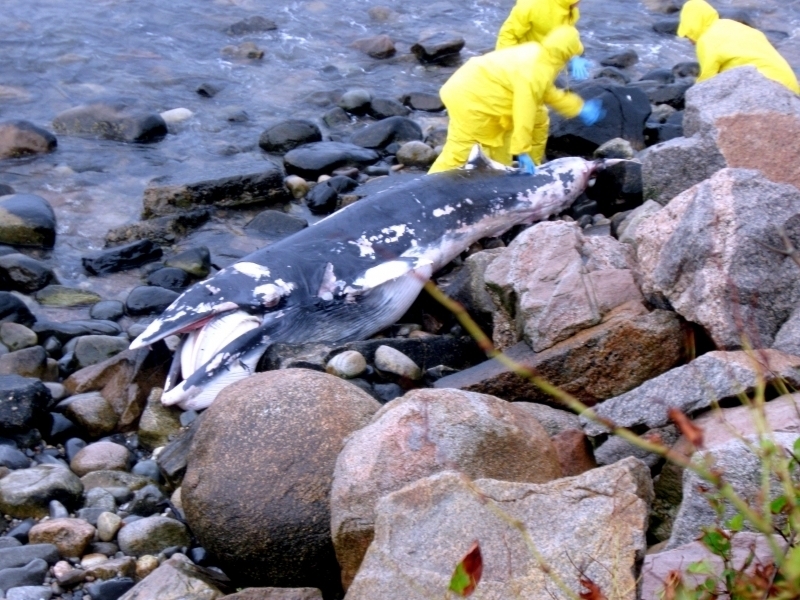 The story of this whale’s name illustrates its blighted history. 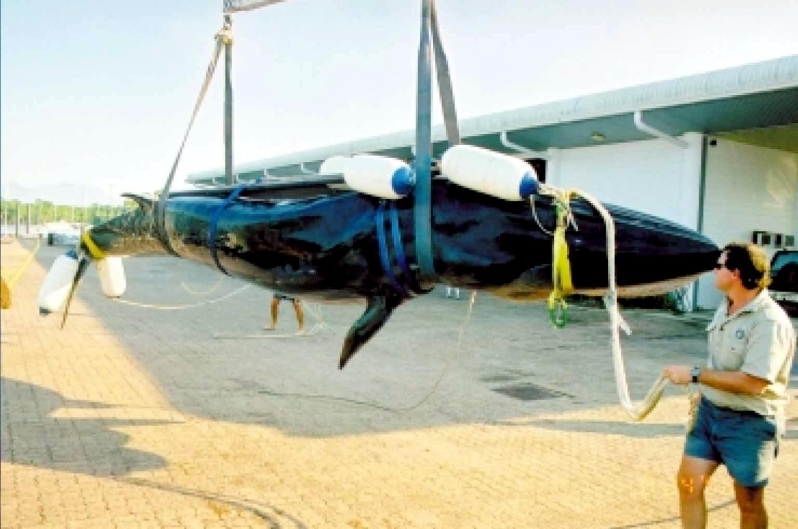 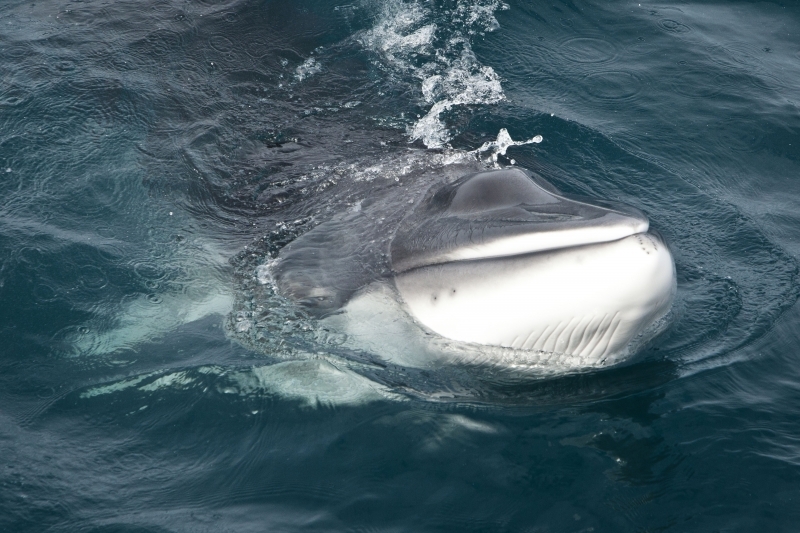 The word Minke was derived from an individual who was an 18th-century Norwegian whaler called “Meincke”, infamous for regularly breaking the rules concerning the sizes and therefore species of whales that he was permitted at that time to hunt. 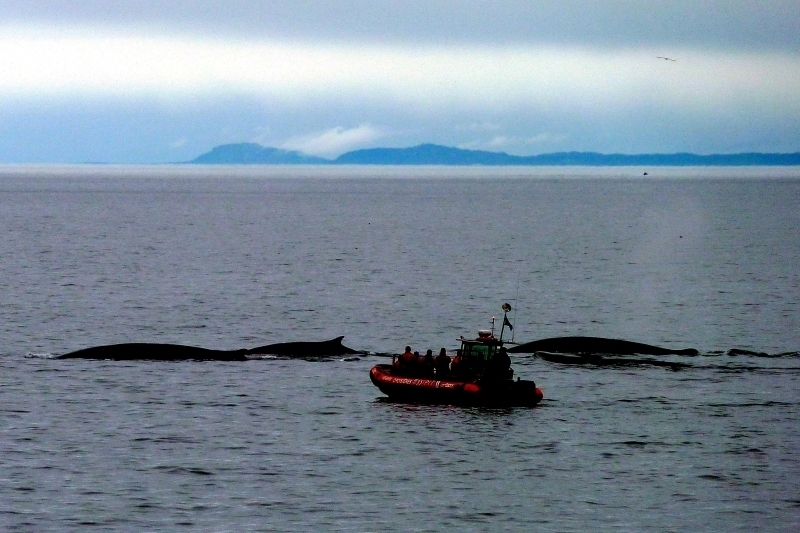 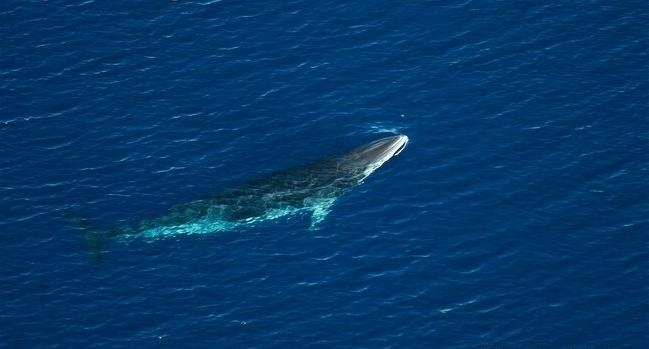 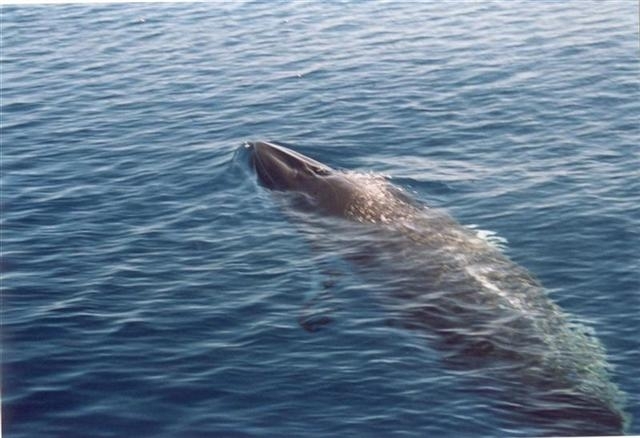 Soon all the small whales became known as “Minke’s whales”. 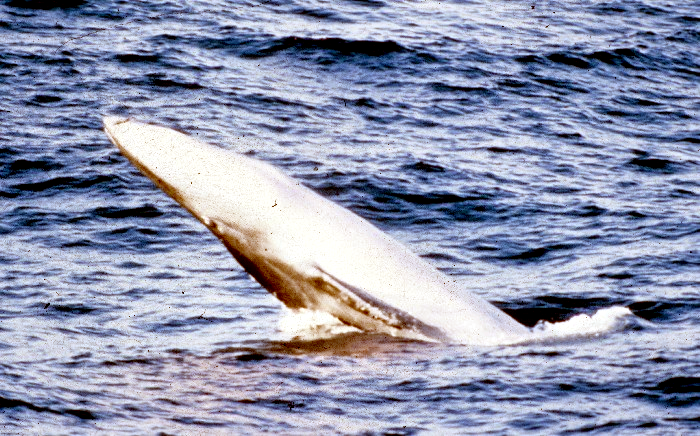 Eventually, it was formally adopted as the name for this small species. 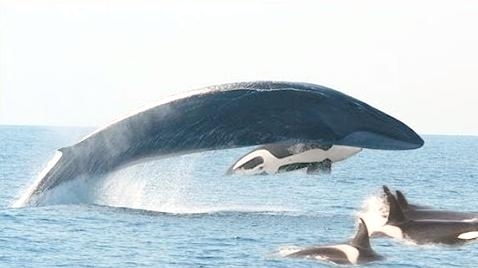 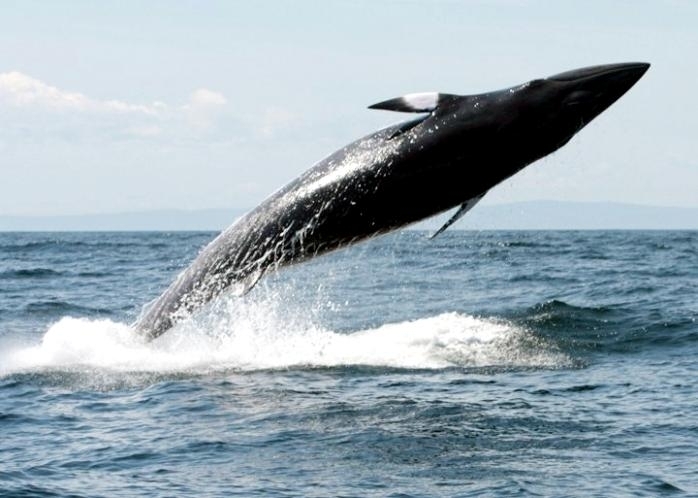 These long, slender whales are much more streamlined than other whales. 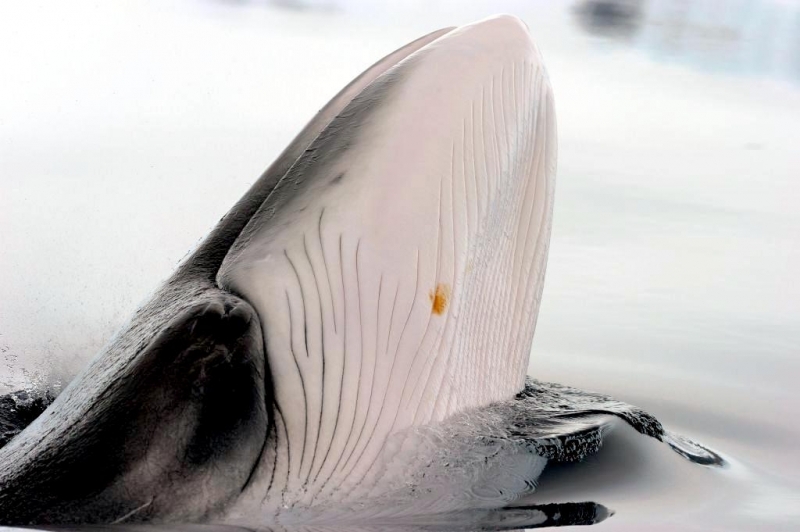 They have a pointed snout that is distinctively triangular, narrow and pointed hence its nicknames “sharp-headed finner” and “little piked whale” paired blowholes and a broad, flat rostrum (upper part of the head). 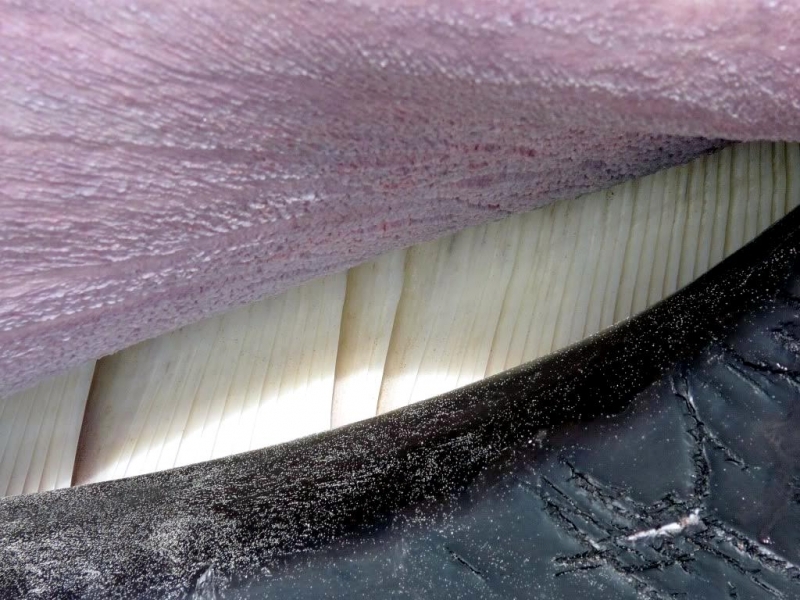 The throat grooves in addition to streamlining the shape of the whale, allow the throat area called the cavum ventrale to expand tremendously during feeding. 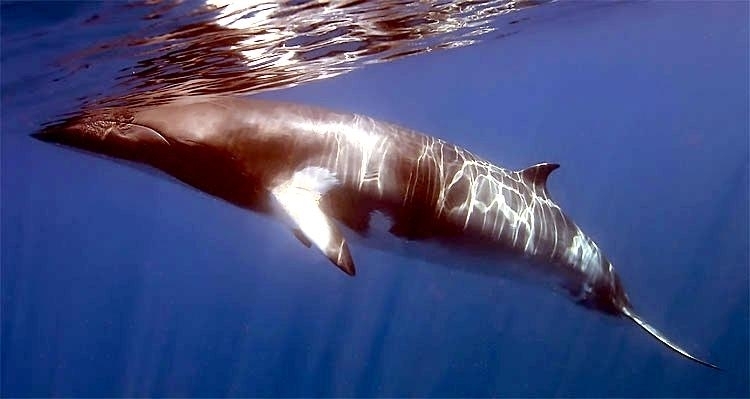 Minkes are the most abundant baleen whale and have a characteristic white band on each flipper contrasting with its very dark gray top color, sometimes with pale trapezoidal stripes behind their flippers on the top. 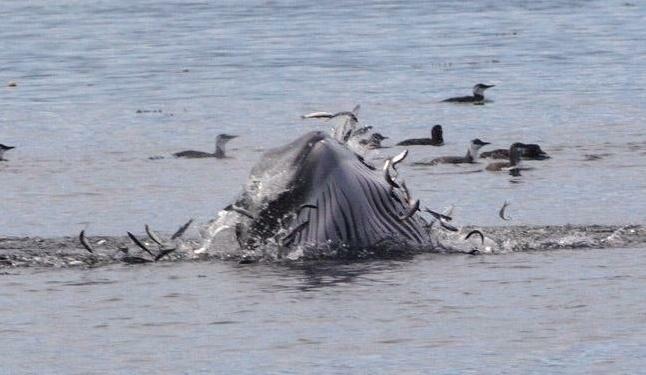 They have 2 blowholes like all baleen whales. 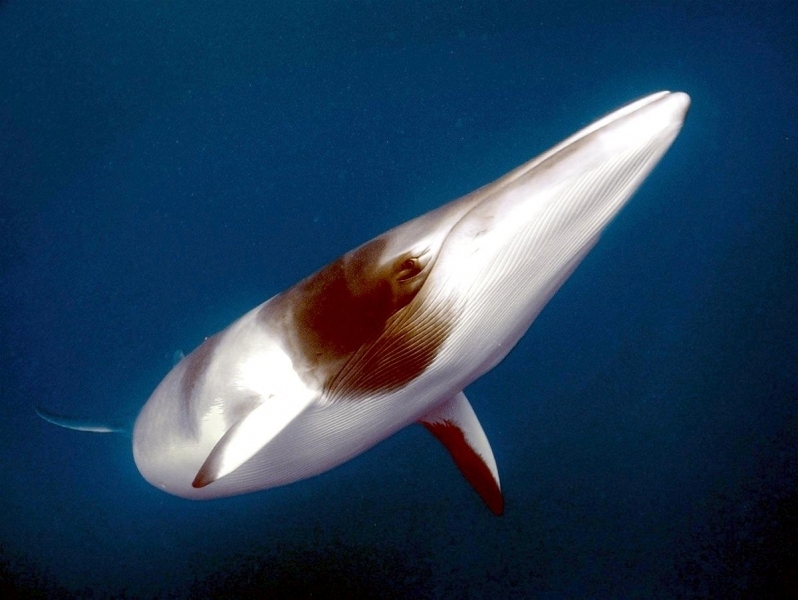 Minke Whales grow to be about 7.8-9 meters long, weighing about 5,400-6,800 kilograms. 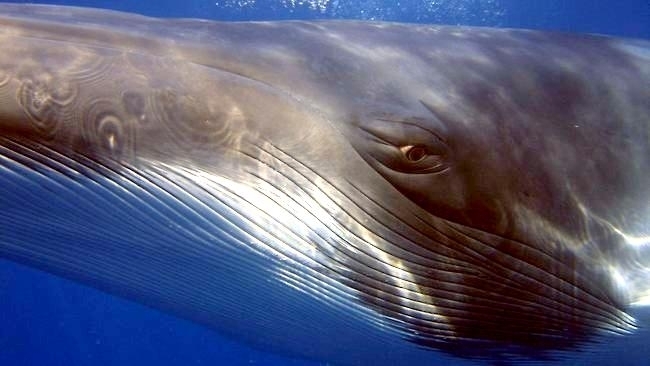 Females are about 0.6 meters longer than males as with all baleen whales. 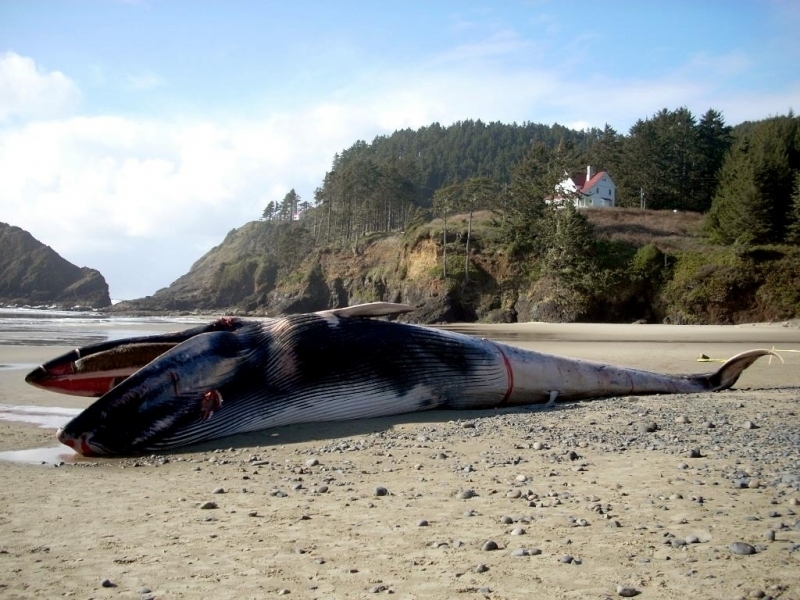 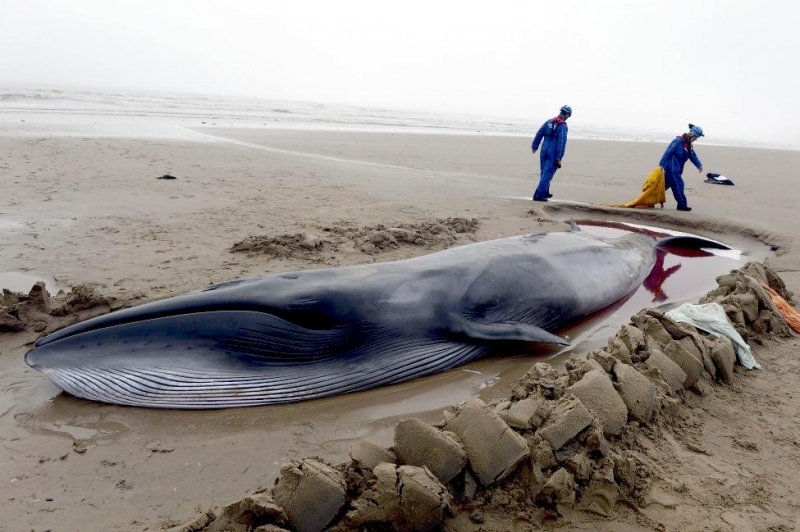 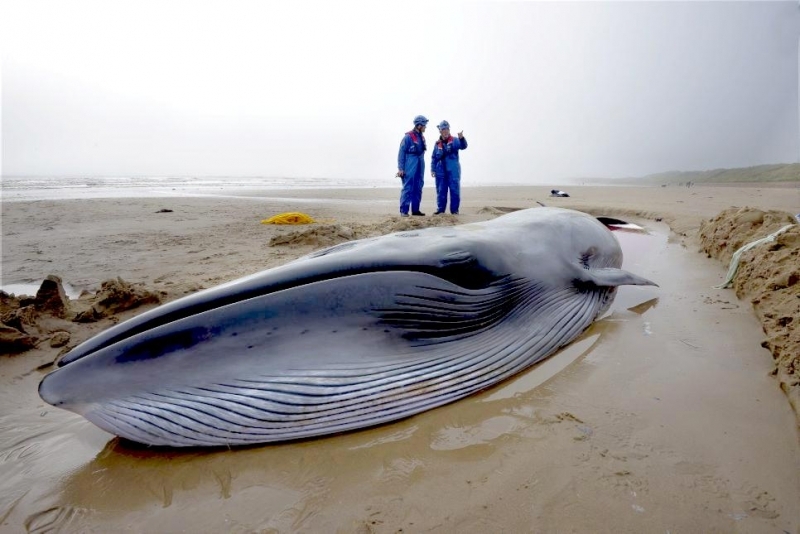 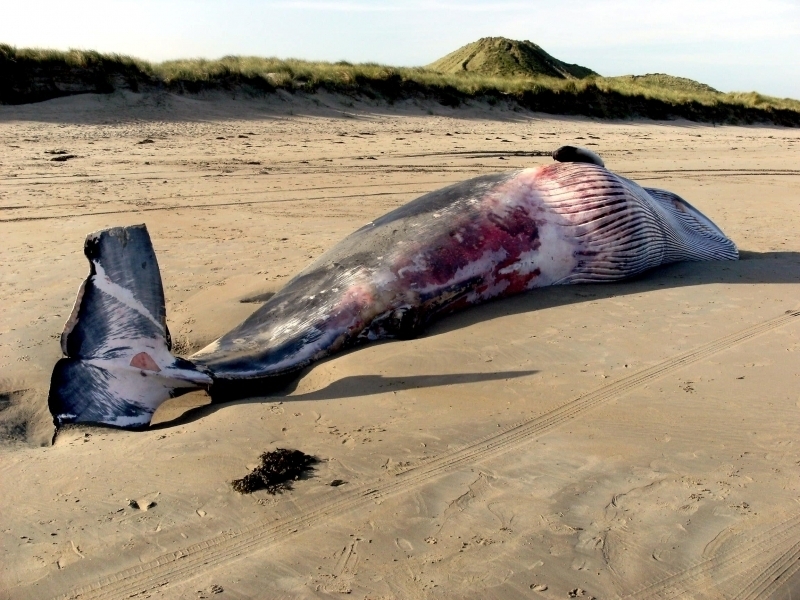 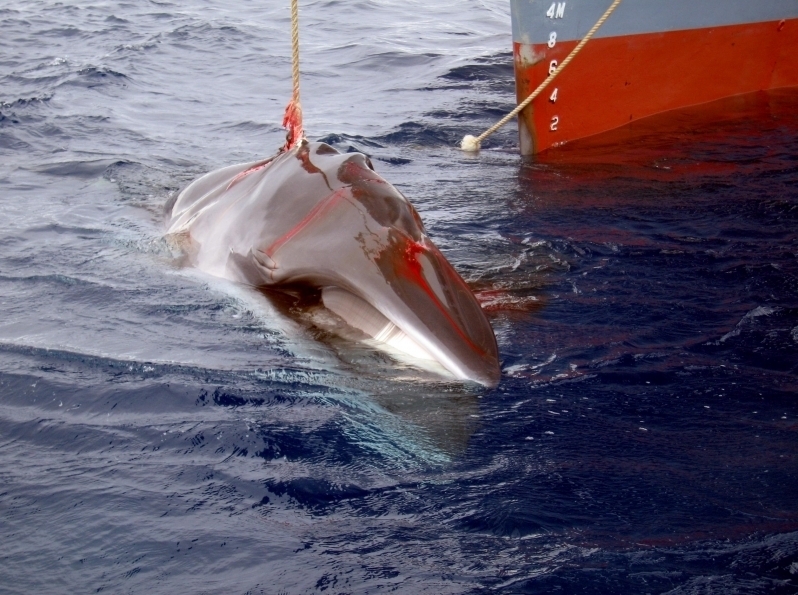 The largest Minke Whale measured was about 10.5 meters long weighing 8,600 kilograms. 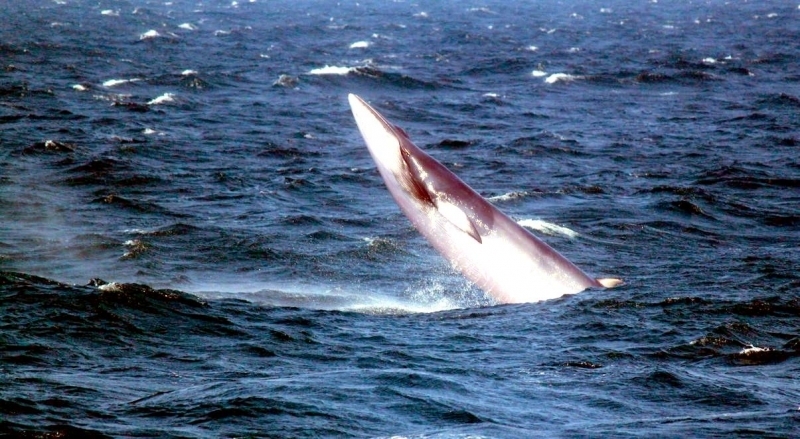 Minke Whales are stocky, having a layer of blubber several inches thick. 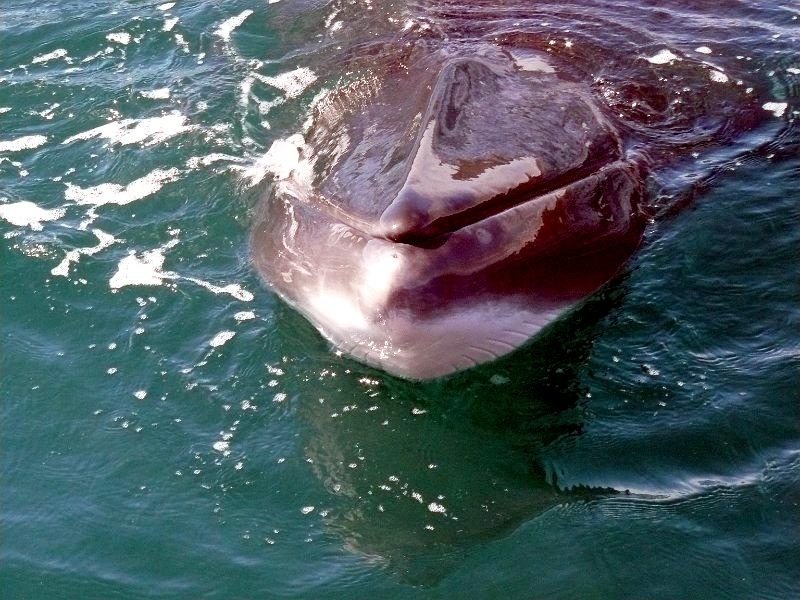 They have 50-70 throat grooves, running from the chin to the mid-section. 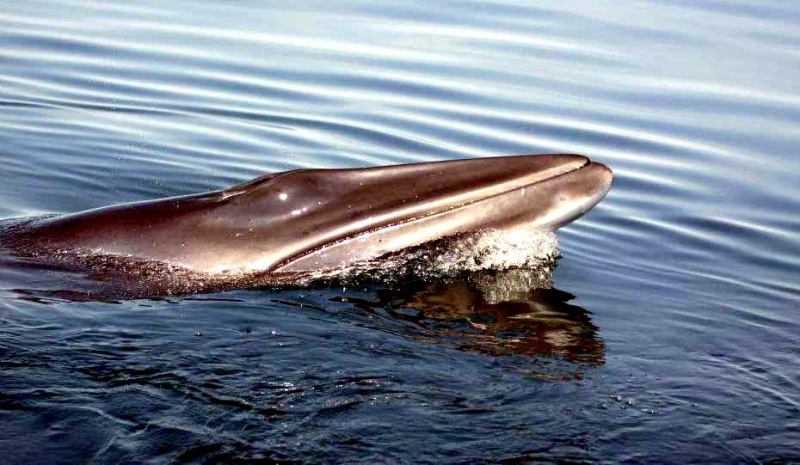 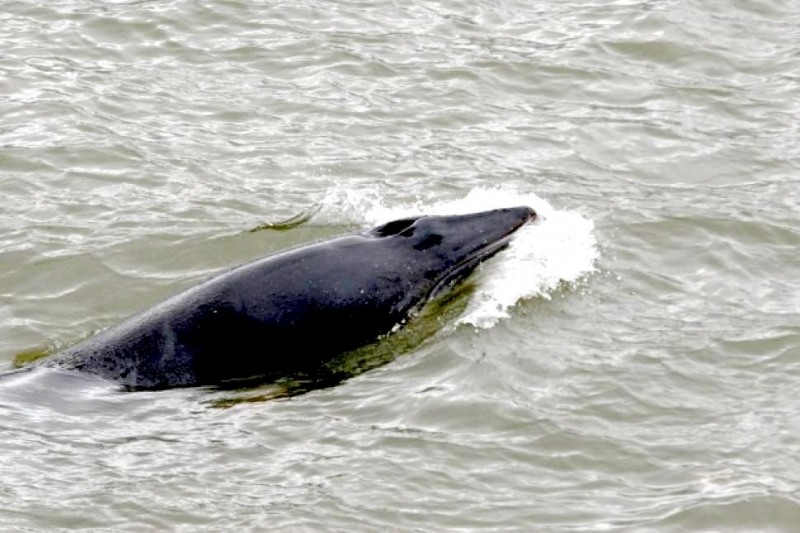 The Minke Whale has two long flippers (up to 1/8 of the body size), a small dorsal fin and a series of small ridges along the its back near the flukes (tail). 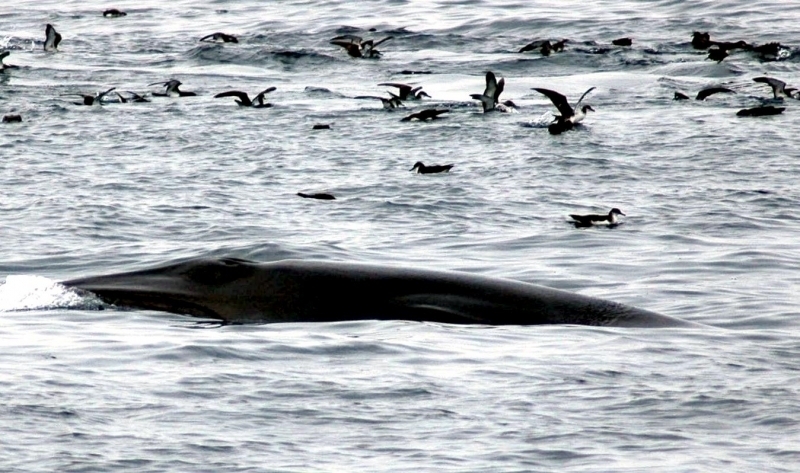 Minkes either travel singly or congregated in small pods of about 2-3 whales. 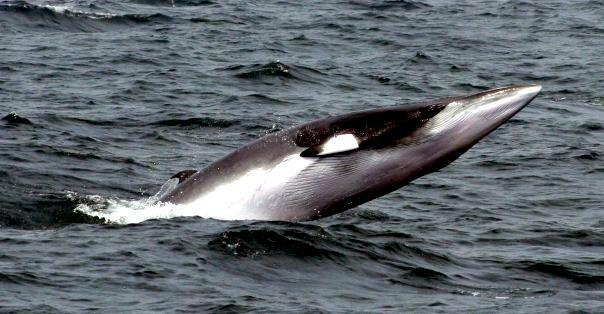 Minke Whales can dive for up to 20-25 minutes, but usually make shorter dives, lasting about 10-12 minutes. 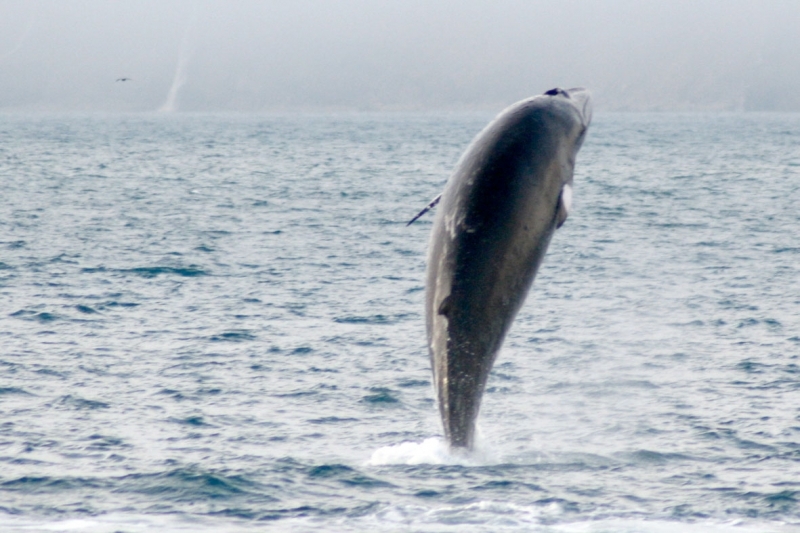 Just before diving, they arch their back to a great degree, but the flukes do not rise out of the water. 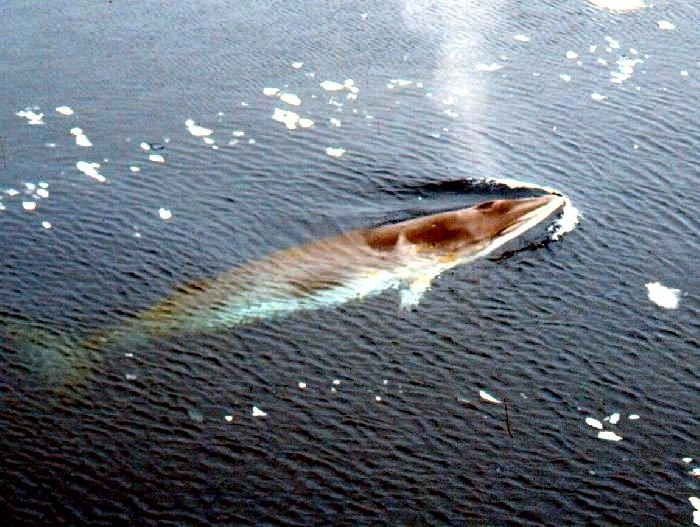 At rest, Minkes spout (breathe) about 5-6 times per minute. 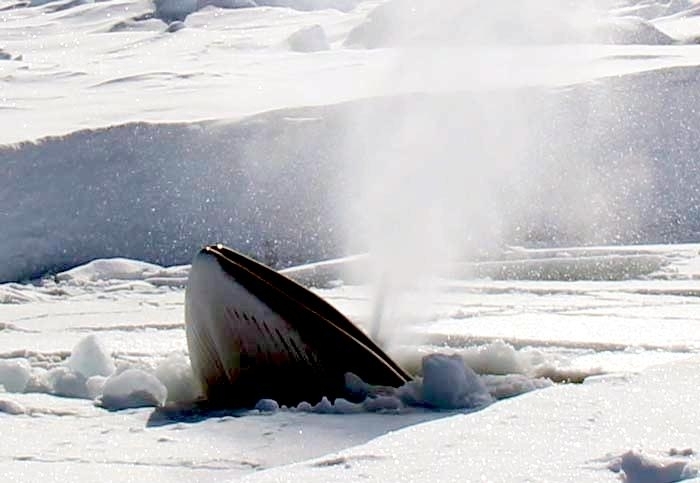 The spout is a very low, almost inconspicuous stream that rises up to 2 meters above the water. 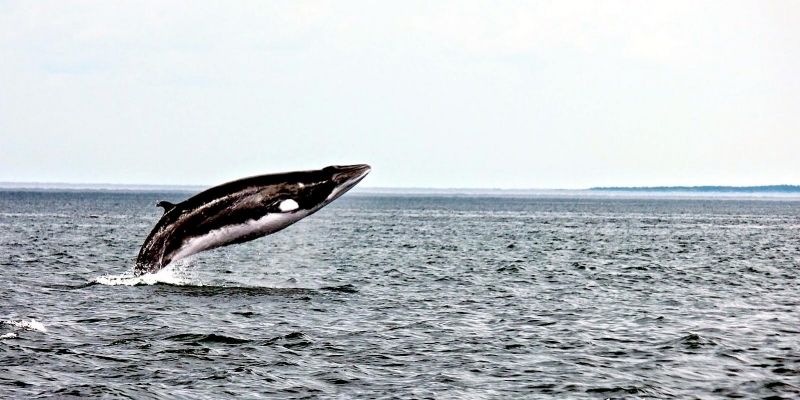 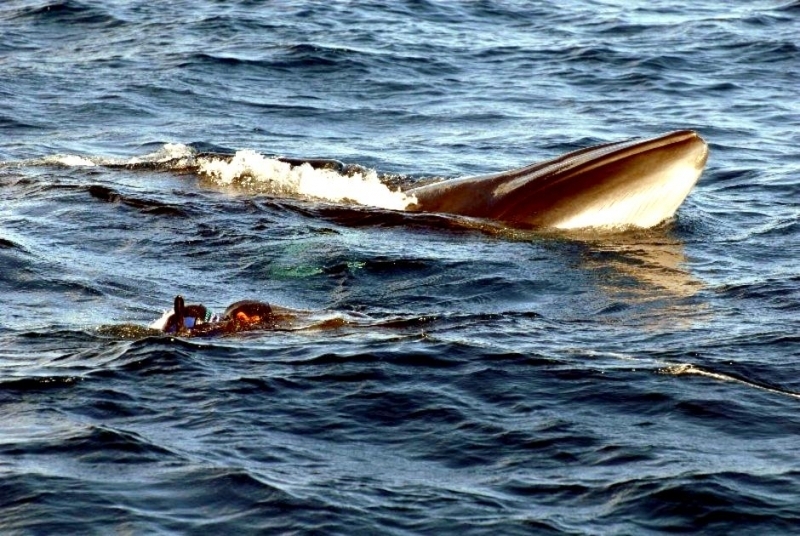 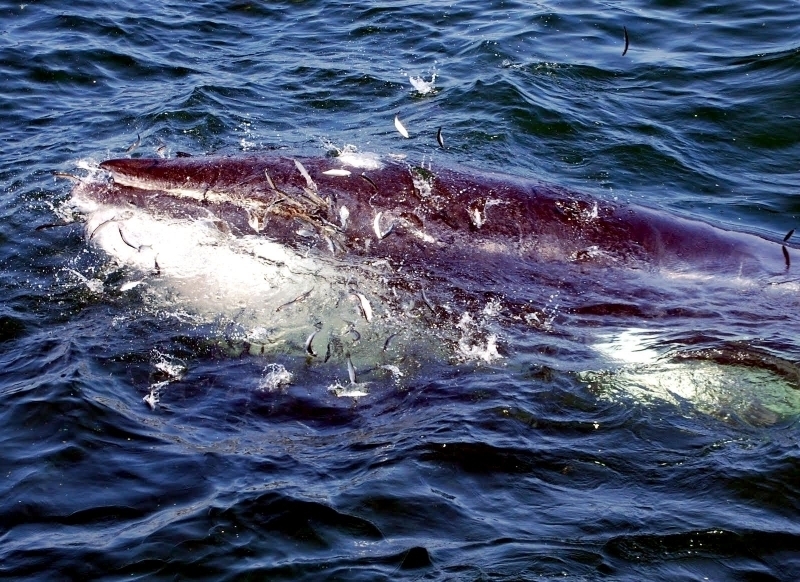 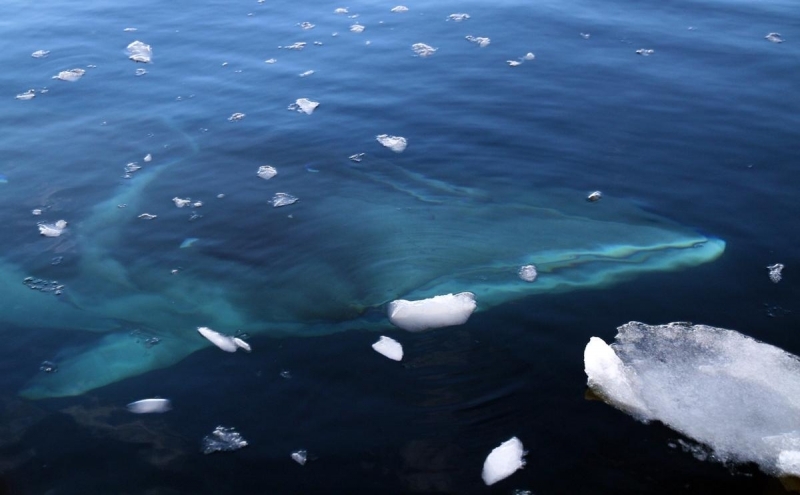 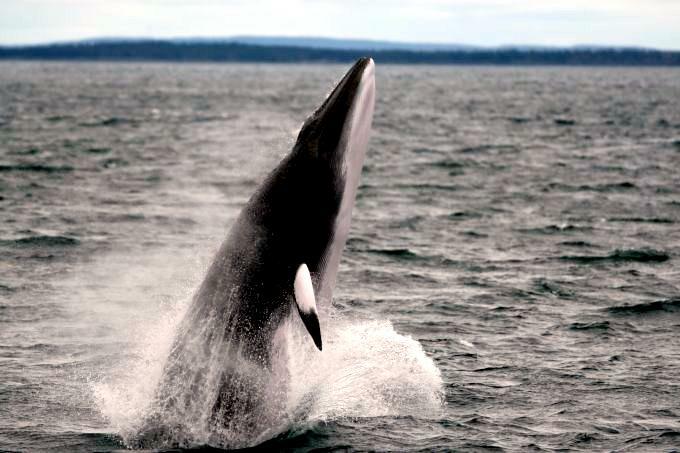 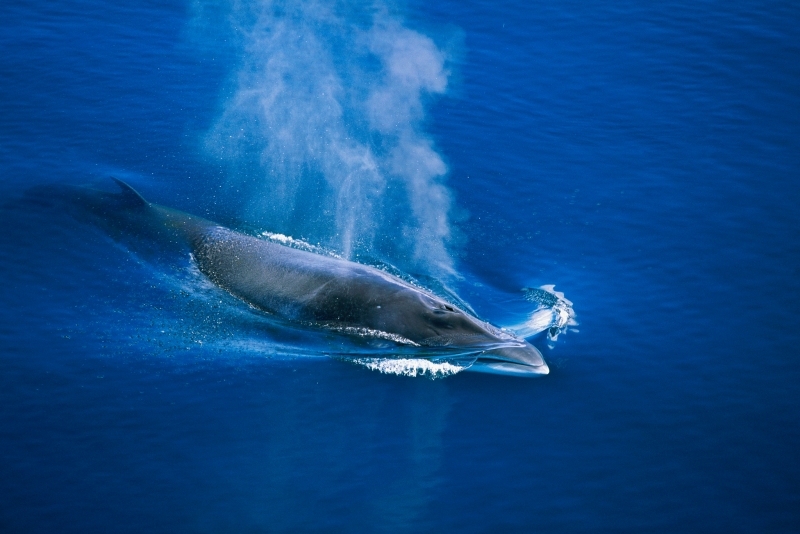 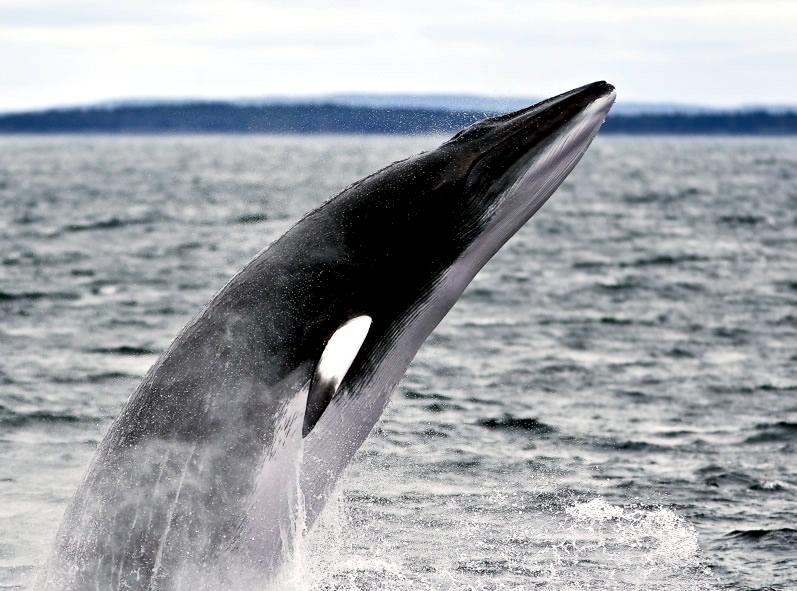 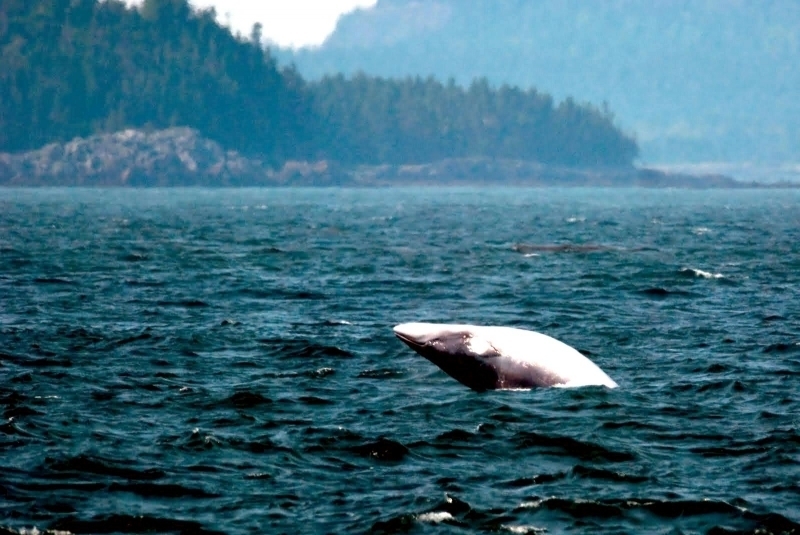 Minke Whales begin exhaling before they reach the surface, which minimizes the blow. 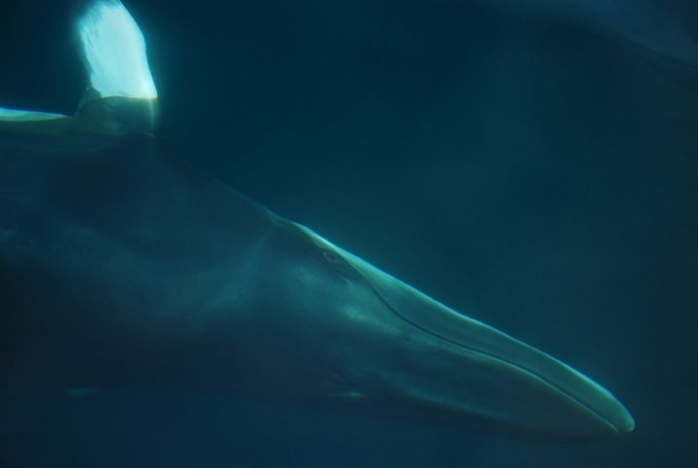 Minkes make very loud sounds, up to 152 decibels which is as loud as a jet taking off with a series of grunts, thuds and raspy sounds usually in the 100-200 hertz range. 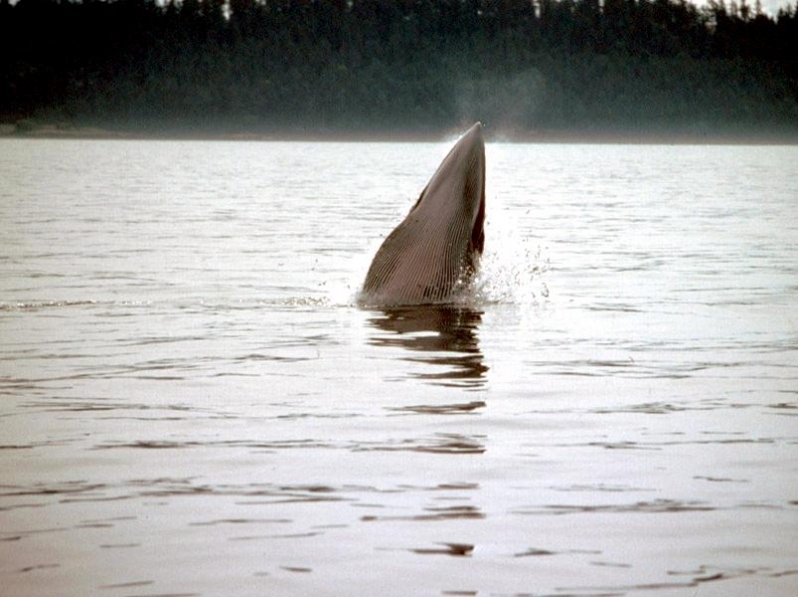 These sounds may be used in communication & echolocation. 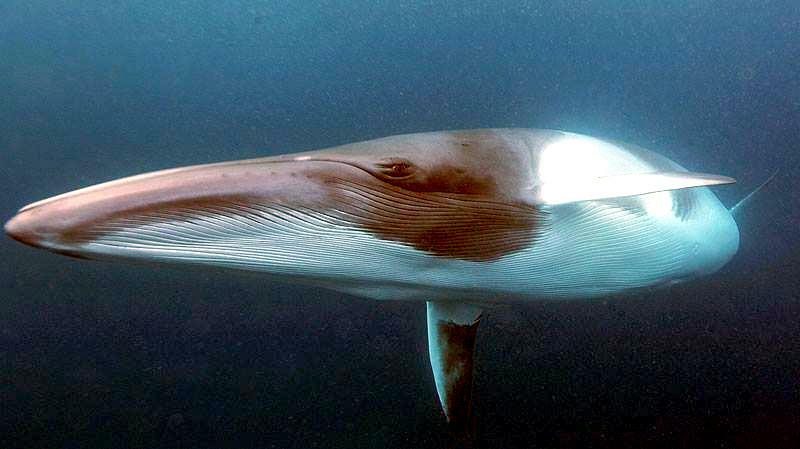 Minke Whales live at the surface of the ocean in all but polar seas. 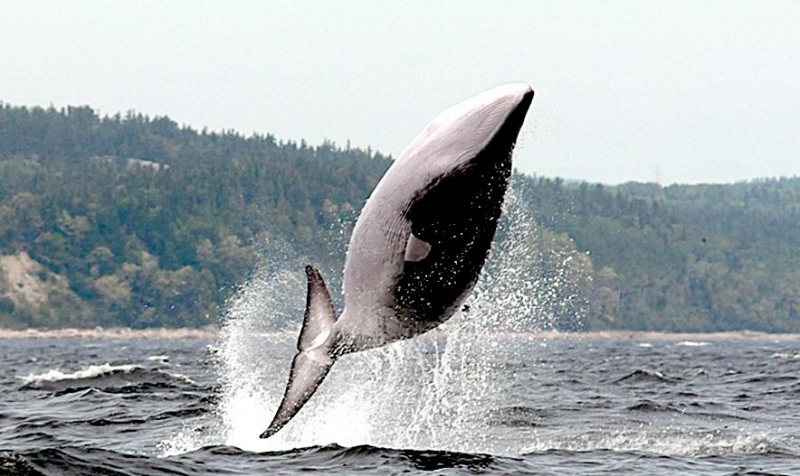 They normally swim at 4.8-25 kph, but can go up to 29-34 kph in bursts when in danger. 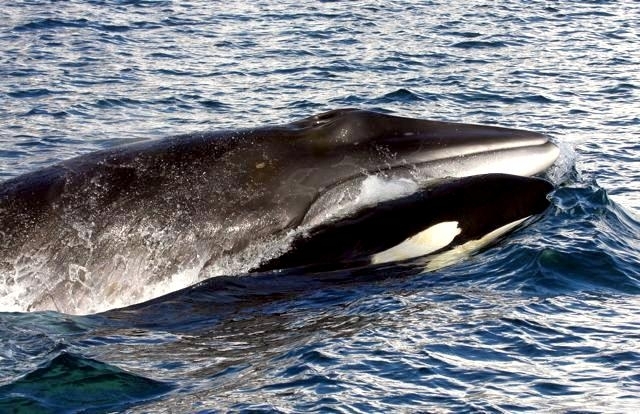 Their feeding speeds are slower, about 1.6-9.8 kph. 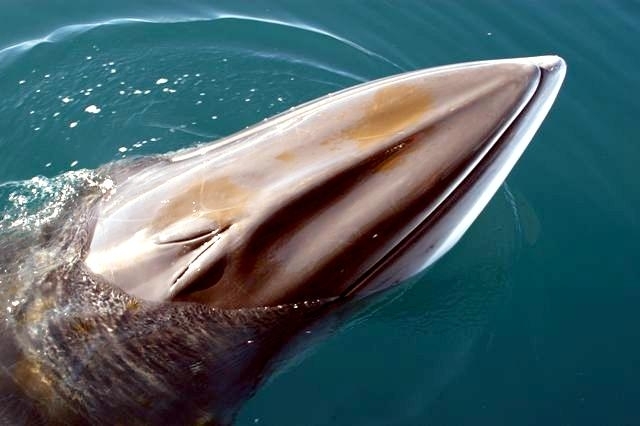 Minkes are seasonal feeders and carnivores sieving through the ocean water with their baleen. 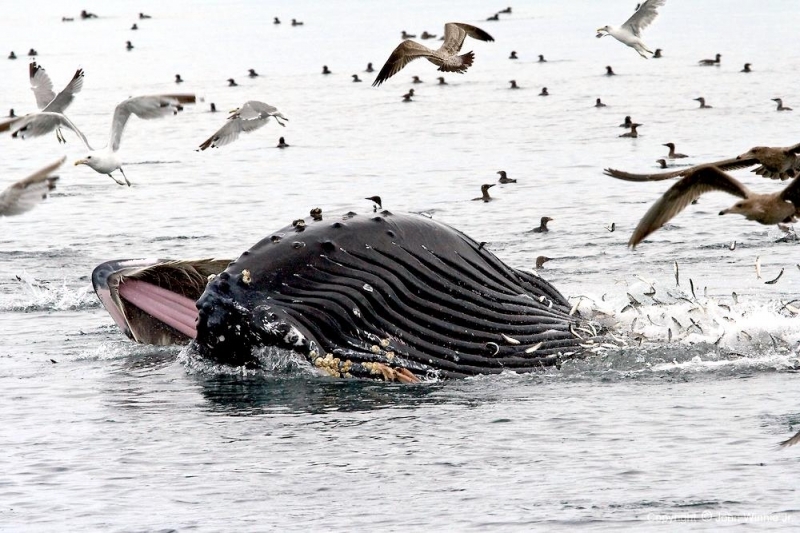 They filter out small plankton, krill and small fish with baleen plates in their jaws that have about 300 pairs of short, smooth plates. 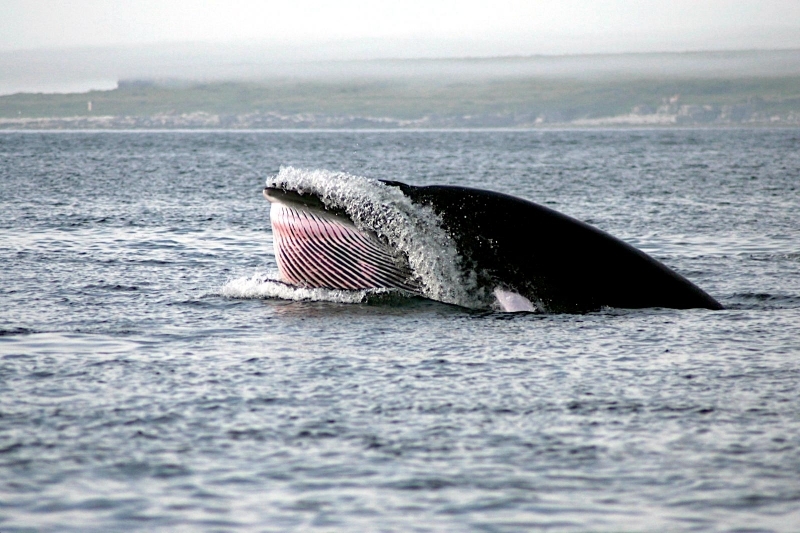 Their largest plates are less than 30 centimeters long and 13 centimeters wide. 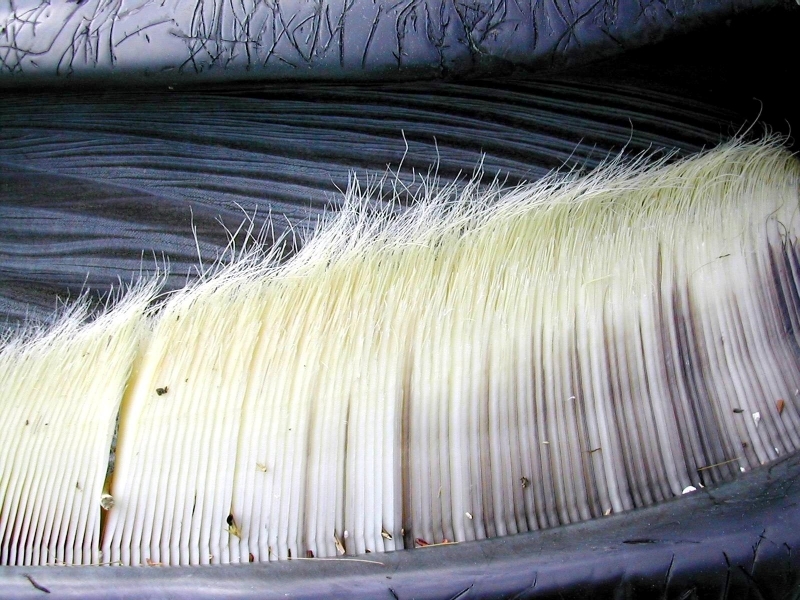 Their fine-textured baleen bristles are fringed and white. 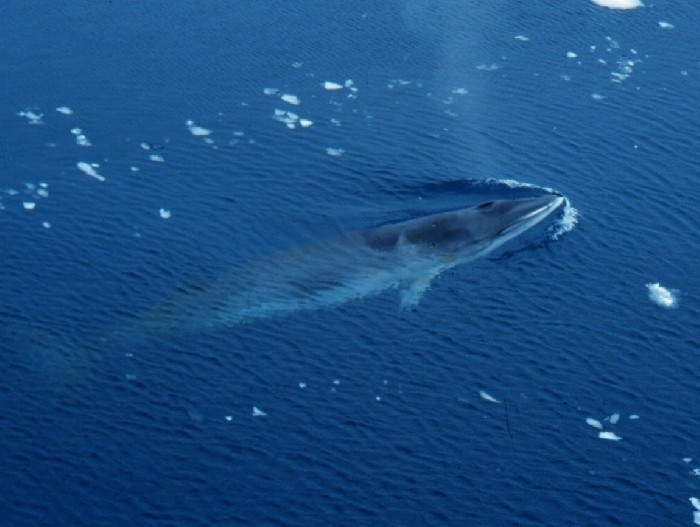 Their breeding occurs mostly in the late winter to early spring while near the surface and in warm waters. 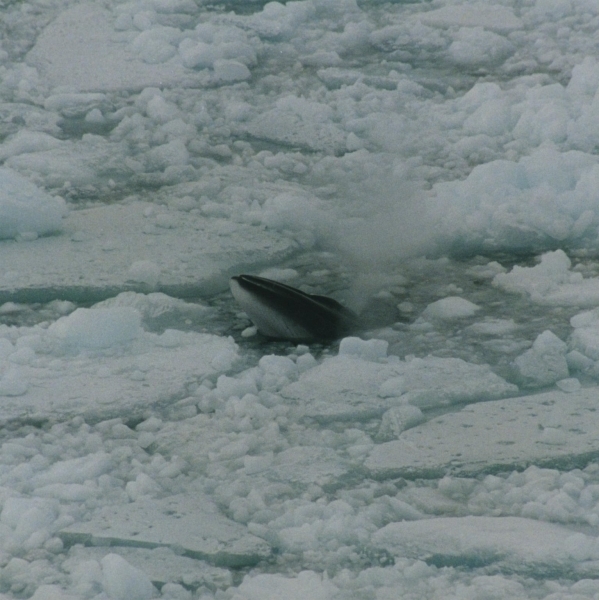 Their gestation period is about 10 months and their calves are born near the surface. 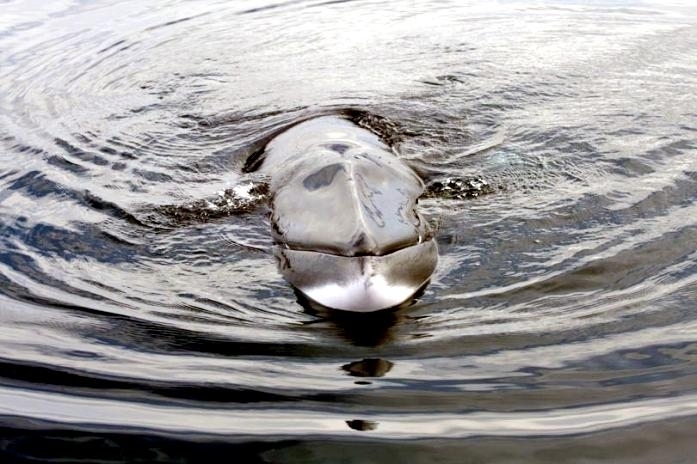 Their newborns instinctively swim to the surface within 10 seconds for their first breath; helped by their mother using her flippers. 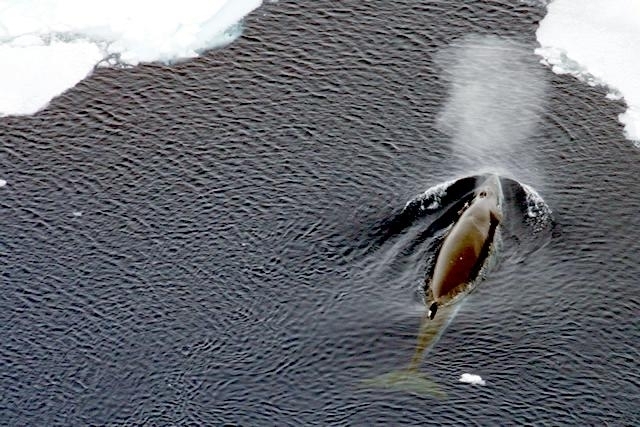 Newborn calves are about 2.8 meters long and weigh about 454 kilograms. 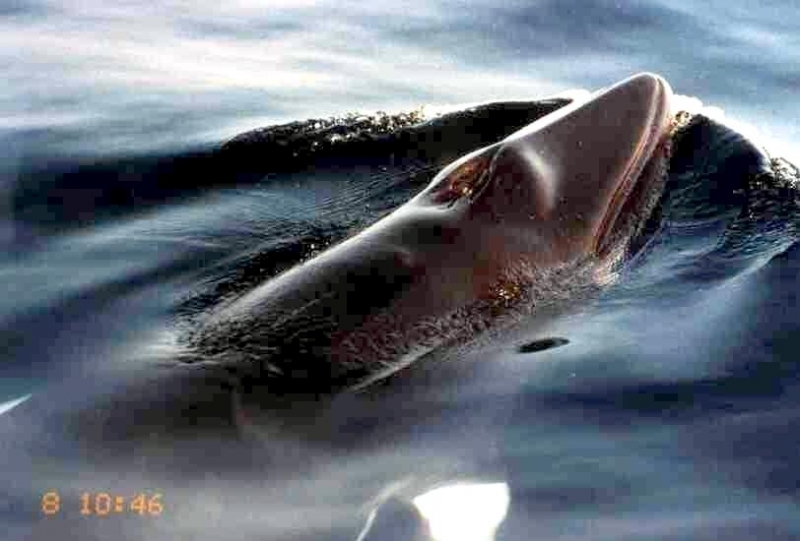 Baby Minke Whales like all mammals, feed on their mother’s milk until they are weaned. 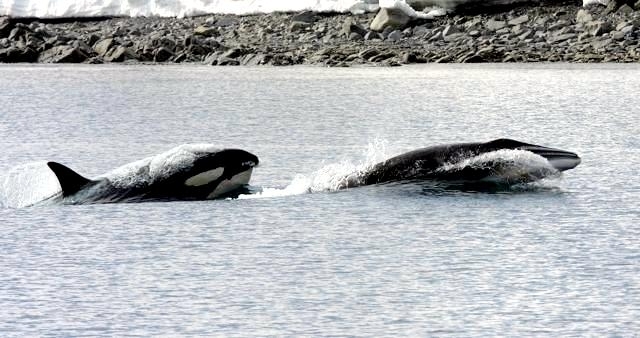 Mother and calves may stay together for a year or longer. 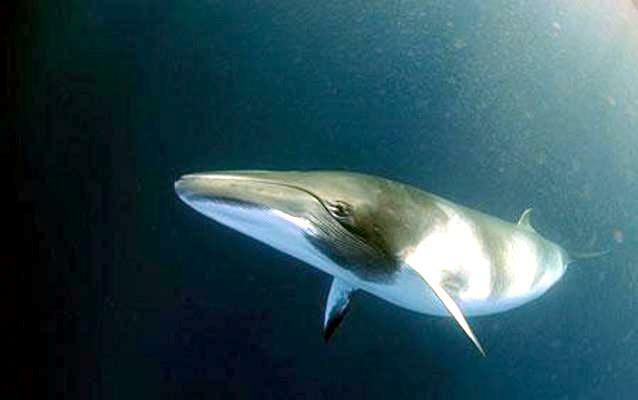 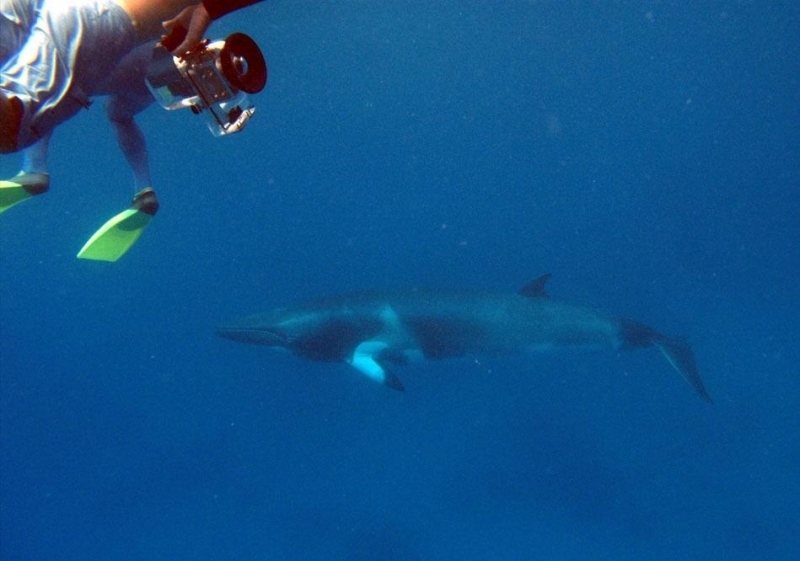 Minkes reach puberty at about 2 years of age and live for over 50 years. 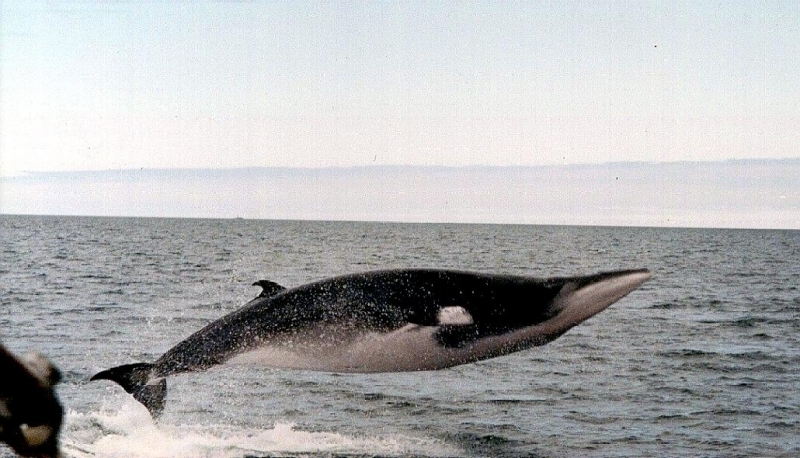 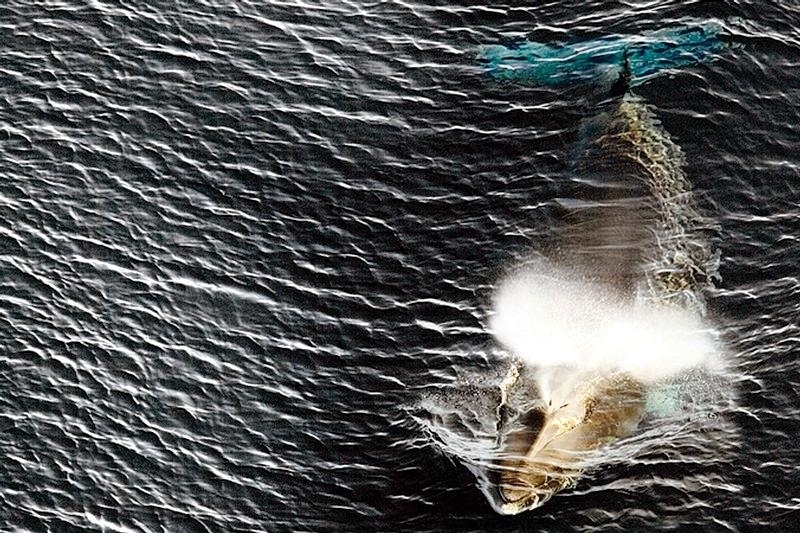 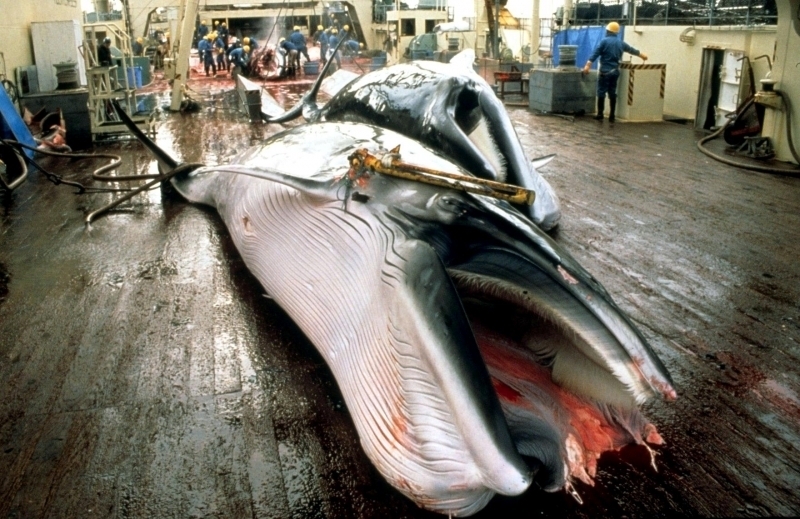 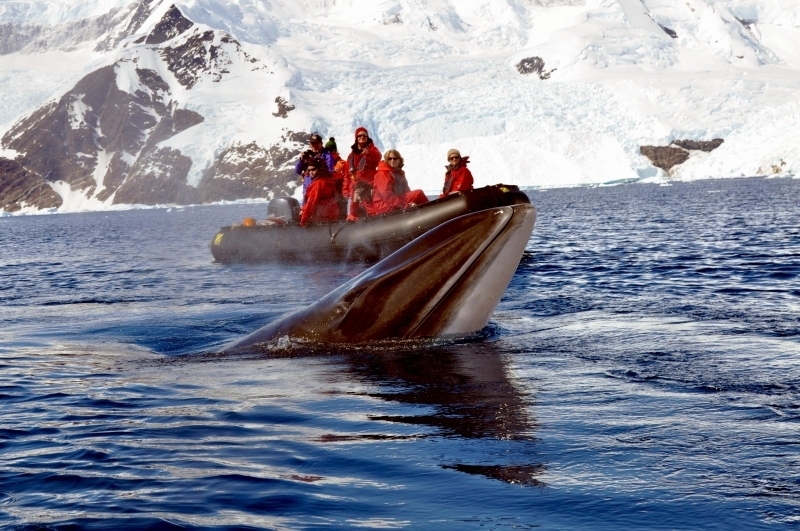 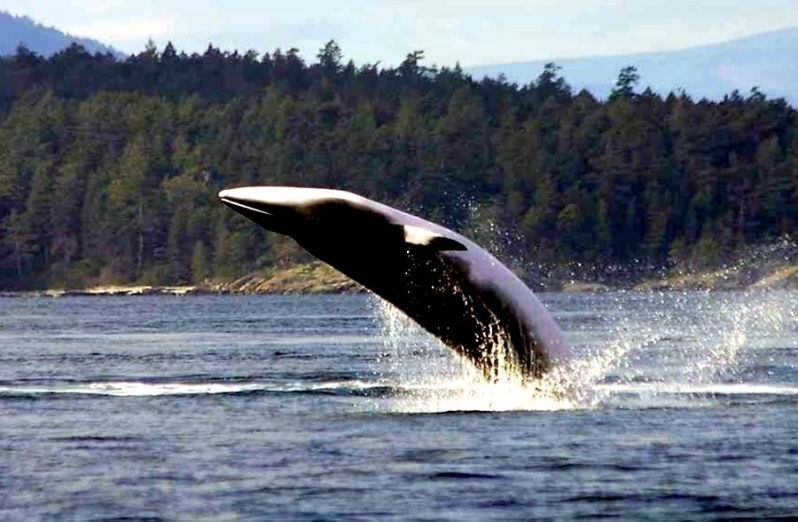 It is estimated that there are about 800,000 Minke Whales worldwide.